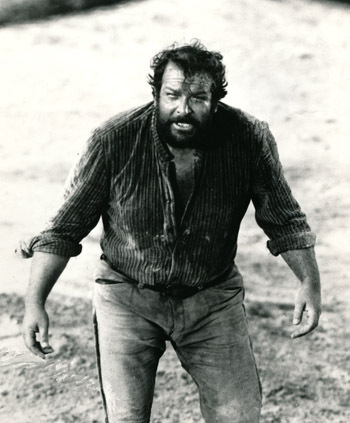 As costar in the movie, Colizzi casts the younger, but in the movie business significantly more experienced Mario Girotti, who also must select a new name and henceforth becomes Terence Hill. I’m not planing to continue my acting career at this time, because the success of Italo-Western movies is declining at the end of the 60’s and therefore I don’t expect any following jobs. But I’m mistaken. The audience likes the new duo Bud Spencer and Terence Hill and the movie is a great success. So it’s only logical that Terence and I are engaged again by Colizzi for two sequels “I quattro dell'Ave Maria (Ace High)” and “La collina degli stivali (Boot Hill)”. Both films reach a wide international audience. Apart from the three Westerns with Terence Hill, during this period of time, I appear also in some movies without my new companion e.g. “Al di là della legge (Beyond the Law)” and “Un esercito di 5 uomini (The 5 Man Army)”. But the really big breakthrough then happens again with my partner Terence Hill. In 1970 renowned cameraman Enzo Barboni succeeds in finding a producer for his directorial debut. He changes his name to E.B. Clucher and hires Terence and me. His innovative idea is to include a peculiar humoristic style and original gags in the spaghetti westerns. The producer is Italo Zingarelli and hiring Terence Hill an me proves to be a lucky strike for all of them. “Lo chiamavano Trinità... (They call me Trinity)” becomes the highest grossing italian film of that time. And just a year later in 1971, the trio Clucher, Spencer and Hill succeeds to beat his own record. The sequel to “They Call Me Trinity” is called “Continuavano a chiamarlo Trinità (Trinity Is Still My Name)” and attracts an even wider audience to the cinemas worldwide. The wave of professional success meanwhile, has only begun for me as I participate in the 70`s in seven other blockbuster films with my buddy Terence Hill and I could also achieve some success alone. In 1973 I play for the first time the role of Commissioner Rizzo, based on my own idea “Piedone lo sbirro (The Knock Out Cop)”. The film is helmed by famous director Steno and produced by Goffredo Lombardo of Titanus. I play the role of Commissioner Rizzo with unconventional methods and a big heart three more times. This role is my favorite at this time. I appear in a total of 21 movies alone in the 70's. In the 80's, I participate in another four successful movies with my partner Terence Hill. In the 1984 success movie “Non c’è due senza quattro (Double Trouble)” we play double roles as lookalikes of two billionaires in Rio de Janeiro directed again by E. B. Clucher. A year later 1985 after our sixteenth movie together to date “Miami Supercops (Trinity: Good Guys and Bad Guys)”, our paths separate. We turn to solo projects. A unique success story comes to an end for the time being. 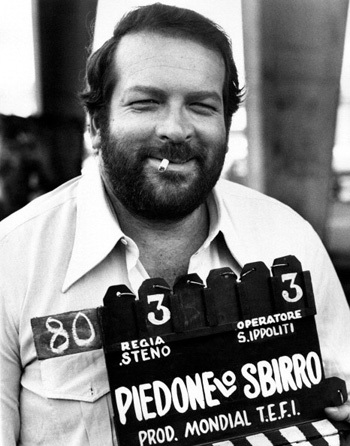 The duo Bud Spencer and Terence Hill attracted tenths of millions of people to the cinemas with their movies. In 1986 I parcitipate in the fantasy comedy “Superfantagenio (Aladdin)” where my youngest daughter Diamante makes an appearance. After that I try something new and become a star in a television series. In 1988 I play and also collaborate on the screenplay for a total of 6 episodes in the series “Big Man” again directed by Steno. In 1990 E. B. Clucher brings me back to the cinema with “Un piede in paradiso (Speaking of the Devil)”. In this movie my daughter Diamante has again an appereance, she plays my daughter. I start a professional cooperation with my son Giuseppe who produces the film. In the years 1991 and 1992 the next television series follows. In “Extralarge” I go on gangster hunt as Detective Extralarge in sunny Florida together with my new partner Philip Michael Thomas former star of “Miami Vice”. My son Giuseppe is involved in both the screenplay as well as in the production of this very successful series. In 1994, Giuseppe finally works to put together Terence an me in front of the camera again. Directed by Terence Hill, we play in the the Western movie “Botte di Natale (The Night Before Christmas)”. The screenplay is written by Terence’s son Jess while my son Giuseppe produces with Horst and Matthias Wendlandt. After that I play with my partner from the first “Extralarge” series Philip Michael Thomas, in “We Are Angels”. Two crooks disguised as monks take refuge in a mission in Costa Rica and fight against injustice. I sing together with Philip Michael Thomas the theme song of the series. I’m now over 70 and start taking it a bit slower. I can now be seen almost exclusively in supporting roles, such as a blind singer in “Fuochi d`artificio (Fireworks)”. The year 2001 will mark my return to italian television. I slip into the role of a priest in the pilot for the planned series “Padre Speranza (Father Hope)”. Again with my son Giuseppe producing and writing. Then in 2003 I play the role of an old pirate captain in Ermanno Olmi`s “Singing Behind Screens”. Just in time for my 78th birthday on October 31, 2007 the filming in Germany for “Killing Is My Business, Honey” begins. I can be seen in a supporting role as an old Mafia godfather. Then I’m in front of the camera of the documentary “Pane e olio”. The nearly 44-minute fairy tale in which I can be seen in flashbacks as a fatherly friend of the protagonist in their childhood, celebrates on December 7, 2008 its premiere in the Italian pay-TV channel Alice. In January 2009 I slip for 11 episodes for “I delitti del cuoco (Recipe for a Crime)” in the role of a retired commissioner who settles on the tourist island of Ischia and opened a restaurant there. Filming in Ischia begins in May 2009 under the direction of “Extralarge” director Alessandro Capone. The series is again produced by my son Giuseppe. The broadcast of the series starts on May 9, 2010 on Canale 5 Italy. Two days earlier, I’m given a great honor. Together with my friend Terence Hill we are awarded for lifetime achievement in Rome with the "David di Donatello", Italy`s most important film prize. On May 27, 2010 my autobiography “Altrimenti mi arrabbio” is published. The same year on november 25 the book is published in Hungary. The book is also published in Germany by Schwarzkopf & Schwarzkopf and marks another great success for me making the top positions in the Der Spiegel List for many weeks. In 2012, the second book titled “In Eighty years around the world - The second part of my autobiography” appears on March 15. In October 2014 I not only celebrate my 85th birthday but my third book is also published entitled “Mangio Ergo Sum - My philosophy of eating”. In this book I describe the nightmare I suffer during a prescribed diet and discuss my philosophical dilemmas with various philosophers from all ages. Now that my body is getting older and don’t obey anymore to my 28 years old mind, I go back to my love for philosophy an I’m already working with my friend and co-author Lorenzo De Luca for a fourth book, a tribute to the millions of dedicated fans all over the world. The new book will include a CD with many different unpublished songs created and sung by me. 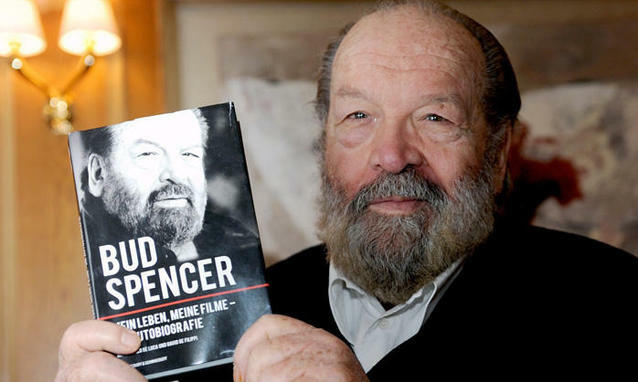 Philosophy has always been a passion of Bud Spencer and he finds interest in his future goals, at age 85, studying what human minds has achieved in the past. He always says that in his mind he is only 28 years old. It is just his body getting old and not responding to what he would like to do. But in his philosophy just “Futtetenne!” (i.e. “don’t care about it!”).